On the third Monday of each month, a large conference room at Vanderbilt Health One Hundred Oaks whirs with activity and is all business — the business of sewing. Shortly before 10 a.m., a small army of women quietly enters the sliding doors of the Nashville healthcare complex, toting and wheeling the tools of their trade — sewing machines, mountains of soft cotton fabric and kits packed with essentials such as spools of thread, straight pins and rotary cutters. The Vanderbilt Sewing Club members come armed with everything they need to transform carefully snipped fabric into neatly packaged gifts for cancer patients receiving treatment at Vanderbilt-Ingram Cancer Center (VICC). The first Vanderbilt Sewing Club, formerly known as the Vanderbilt Auxiliary, originated in 1928 when a group of physicians’ wives began sewing baby clothes for needy families with newborn infants, and the group still gathers to sew items for the adult and children’s hospitals. The newest group of sewers began in 2012 specifically to sew items for patients receiving cancer treatment, said Julie Bulger, a program manager with Vanderbilt University Medical Center (VUMC) Volunteer Services. Bulger co-founded the One Hundred Oaks group with club chairman, Mary Elliott. For club members, this truly is a labor of love, as well as a welcome opportunity for old and new friends to gather and share what for most is a lifelong passion for sewing. But for a few club members, the significance of the hours they spend together stitching care items is even more personal. In 1999, Harris’ quick trip to her primary physician for what she thought was a minor skin irritation turned into lumpectomy surgery followed by many weeks of radiation treatment. Across the room, Paceda Petrone set up her prized vintage serger, painstakingly threading several large spools of thread through the machine as she prepared to stitch together brightly colored knit caps. “My son’s 33, and this serger is about the same age as he is,” Petrone laughed. Petrone has been with the One Hundred Oaks group since it began, and as a breast cancer survivor reaching her 10-year post-treatment anniversary this year, she feels a special connection with the recipients of her handiwork. The group began after Bulger gathered some skilled volunteer seamstresses together at Gilda’s Club, a nonprofit support organization for cancer patients, to sew caps for individuals undergoing treatment. She realized that the need extended far beyond the one-day event. Bulger had met Elliott, a member of the American Sewing Guild – Nashville Chapter, as she sewed that day, and she asked if Elliott would be interested in continuing sewing for VICC patients, with the thought that an internal group at VUMC could more quickly respond to needs and special requests. Elliott agreed, and many of her fellow sewing guild members joined her without hesitation. Participation has grown by word of mouth, and small monetary donations keep the group supplied in fabrics and needed sewing notions. A Vanderbilt professor who came up with the idea for the apron for the drainage tubes based on her experience with breast cancer now asks friends and family to donate to the Vanderbilt Sewing Club in lieu of birthday and Christmas presents. And other former VICC patients, who first learn about the group when they receive their care gifts, later get in touch with thank you cards and often add a donation, Bulger said. Bulger works with Look Good Feel Better, a free program for individuals undergoing cancer treatment, and she gets direct feedback from patients on what items they would like, and what works best and what doesn’t. 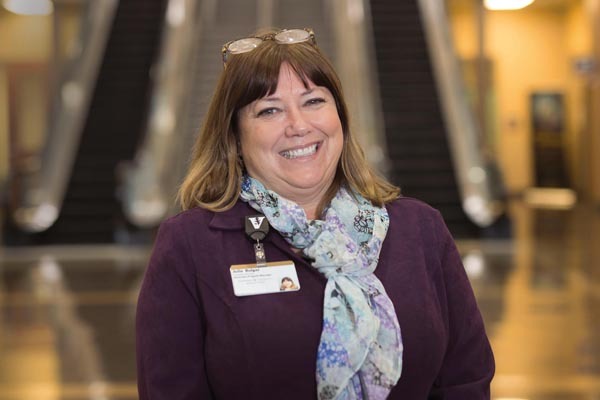 Lynn Fleischer, who has volunteered at VUMC for 26 years initially as a candy striper, agrees that the camaraderie is a huge benefit of the group. Among the ladies, she is known as the “cutter extraordinaire” as she rapidly lays out the freshly laundered cotton and transforms the material into perfect pieces so the others can get right to sewing when they come in the door. Sheri Spears, RN, a medical infusion nurse at the One Hundred Oaks Breast Center, is a huge fan of the port covers that protect patients’ infusion sites, but she also witnesses firsthand the emotion that comes with the realization that a stranger cares as she hands out lap blankets to protect patients from the chill of the clinic.